Chet Chadbourne, blessed with a modicum of skill as a ballplayer, was one of the lucky New England mill town kids able to escape factory life the early years of the 20th century. He began playing professional baseball at the age of 22, and he was not completely out of the game until he was in his 50s. Chadbourne played professional baseball from 1906 through 1927, primarily as an outfielder, and then he hung on a few years more as an umpire in the minor leagues. He played five seasons in the majors and 20 in minor-league ball, amassing 12,578 professional at-bats. He hit .255 as a big leaguer and .287 over his minor-league career. A little stocky, with his 170 pounds on a 5-foot-9 frame, he hit left-handed and threw right. Chester James Chadbourne was born in Parkman, Maine, on October 28, 1884, to Hiram Chadbourne, a farmer, and the former Julia Augusta Libby, both of Harmony, Maine, where Chet grew up. Hiram died in 1885, not long after his son's birth. Julia appears to have taken up work as a housekeeper. By the time of the 1900 census she was living in Guilford, Maine, in the home of Milton Glass with three of her 13 children (It appears that Hiram was her second husband; her first, named Bean, had died, perhaps during the Civil War.) Not much is known about Chadbourne’s family. As a teenager both Chet and his older brother Arthur worked as carders in the woolen mill in Piscataquis County. Their sister Sylvia worked as a burler in the mill. Younger brother Plummer Chadbourne showed some pitching talent but never made the pros. Chet graduated high school in Guilford, and perhaps played some ball for the mill team. In 1905 while playing for Gardner in the semipro Maine Trolley League, he was discovered by Fred Doe of the Worcester Busters, who signed him to his first pro contract. Chadbourne began his professional baseball career in 1906 with that team, where he hit .322 for manager Jesse Burkett over the course of 114 games and attracted the attention of the Boston Americans that fall. Though normally an outfielder, he'd been playing a fair amount of infield due to injuries on the Busters, who still finished 7 1/2 games ahead of anyone else for first place in the New England League. Boston purchased both his contract and Harry Lord's on August 24. Chadbourne signed with the team on September 14 and made his major-league debut on the 17th. Chadbourne started the game, batting second in the order and playing second base. He was 1-for-4 on the day, singling between short and third in the seventh inning and scoring. He singled again the next day and scored twice. He appeared in 11 games, hitting for a .302 average and driving in three runs. He returned to his home in Maine for the winter, feeling fairly sure that he'd be back with Boston in 1907. "Chad" played minor-league ball for the next six seasons: for the Orioles in 1908, the Indianapolis Indians in 1909 and 1910 (after the New York Highlanders bought his rights from Dunn and farmed him out), and then—after he bought his own rights back from Indianapolis--for the Portland Beavers in the Pacific Coast League from 1911-13. Chadbourne did not enjoy smooth sailing all the time. In mid-June 1909, he abruptly quit the Indians and returned to Maine. Whatever sent him there got smoothed over, and he played out the season and the next, hitting .246 and .252 respectively. The opportunity to sign with Portland arose out of a friendship he'd developed with Indianapolis manager Charley Carr who allowed him to become a free agent after the 1910 season. (Carr became manager of the Kansas City Blues in 1912, and wanted Chadbourne back, but it didn't work out.) In his first year with the Beavers, Chadbourne played right field and got into 196 games (the PCL played a much longer season), hitting .298. After a .275 season in 1912 and .286 in 1913, Chadbourne, like many others in both the major and minor leagues, ignored the reserve clause and "jumped his contract" to sign on with a team in the newly-formed Federal League, the Kansas City Federals, with whom he signed a three-year contract. Sentiment played no part in the process, he said; it was the money he was after. He played almost every game for Kansas City, hitting .277 his first year, then .227 in 1915. With the collapse of the upstart league, and with no other team claiming him, the National Commission ruled that he was rightfully the property of Portland. But Beavers owner Judge Walter McCredie didn't believe Chadbourne much help for his club and so permitted him to become a free agent. He put in a year with Memphis, in the Southern Association, hitting a disappointing .235, the worst of any year in his career. He was released to Chattanooga after the season, but he soon ran afoul of his new club. Although said to be a "magnificent defensive player, but a little light with the stick," he was also reportedly "unreasonable, in the opinion of management, in his salary demands." Consequently he was "given the right to sell himself." He wound up with the Oakland Oaks, playing left field again in the Pacific Coast League. But not for long. The club placed Chadbourne on waivers near the end of April. The Vernon Tigers had a player hurt and brought him in. He played so well for them that he played out the season--and then seven more years after that. The 1917-24 stretch was only interrupted in the "war year" of 1918, when the PCL shut down in late July. At this juncture the Boston Braves took him on for five weeks before the major leagues stopped playing, too. With the Braves, no doubt some of whose patrons recalled seeing him play for the Boston Americans almost a dozen years before, he got into 29 games and hit .260. After the short stint in the majors, the last time he would be there, Chadbourne returned to Los Angeles to play in one of six teams in a planned Southern California War Service League. Chadbourne’s best year with Vernon was 1923, when he hit .317. 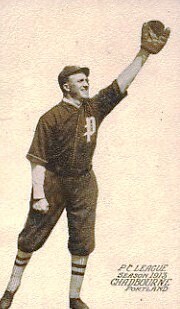 He slipped to .255 in 1924 and when the season was up, team owner Ed Maier, grateful for his service for the Tigers, set him free so he could perhaps seek a job as manager. Chadbourne, the Times said, "is one of the best-liked players in the game and his many friends will be pleased to learn of his being made a free agent and being able to land a pilot's berth. The veteran Chad is one of the smartest men in baseball racket and it is a certainty that he will soon be grabbed by some owner needing a manager." Instead of managing, however, Chadbourne wound up playing with the Wichita Izzies in the Class A Western League where he hit .325. The next year he signed on with Salt Lake, a Class C team, where he hit .410 in 51 games. As one of three managers for the team, he also pitched and won a full nine inning game despite walking six and allowing seven runs. His final year as a player was 1927 with the Oklahoma City Indians. The following year, Chadbourne filled in for three weeks as an umpire in the PCL and was then hired on full-time for 1929. In 1930, he got involved in a fracas in Sacramento with Oakland outfielder Buzz Arlett. Chadbourne ejected Arlett from the game, then found the ballplayer waiting for him outside the clubhouse after the game. According to the Los Angeles Times, "Chadbourne, almost 75 pounds lighter than Arlett, defended himself with his mask, kayoing the big outfielder and sending him to the hospital, where it took 12 stitches to closer a cut over his right eye." The league suspended both men. Chadbourne was back at work a few days later, and Arlett returned in a week's time. Chadbourne officiated the rest of the year, and worked in some major-league spring training games in 1931, but his next regular work was umpiring in the Western League in 1932. He's found in occasional Coast League box scores into 1935. After baseball, Chadbourne moved to Los Angeles and became a bartender. Then on June 21, 1943, for reasons unknown, he took his own life with a pistol. He was 59 years old, and he left behind a wife, Gladys (Weymouth) whom he had married in Maine after the 1908 season. In addition to the sources noted in this biography, the author also accessed his player file at the National Baseball Hall of Fame, the online SABR Encyclopedia, Retrosheet.org, and Baseball-Reference.com. Maurice Bouchard was very helpful in piecing together Chadbourne's family background.